Skulls and skateboard graphics go together like peas and carrots and today’s Featured Deck is skulls on skulls on skulls. 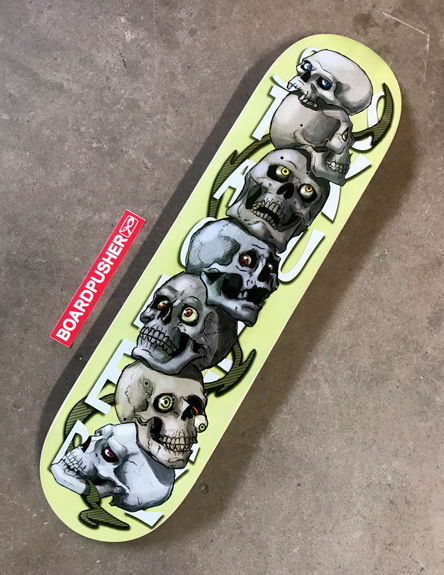 “Stacked Skullz” was designed by Werner Hoefner and is also available at BoardPusher.com as a customizable background. Follow Werner on Instagram @whmozart or see more of his skateboard graphics at BoardPusher.com/shop/WHDesigns. Whether you like sporting classic style graphics or have modern fresh ideas, it’s easy to put your own custom design on a skateboard at BoardPusher.com.